Hello! Long time no chat. Well at least it seems like it's been a long time. It's been a bit of a crazy start to this month (and there really is no signs of it slowing down....for the rest of the year!) so nails have had to take a little bit of a back sit. But never fear, I am still here and posting. There may just be some slightly longer gaps in between my posts. Anyway, today I have my swatches and review of the new Uberchic Beauty Art Deco Flair Stamping Plate to share with you. For some strange reason I automatically started thinking about black and gold nails looking at this plate. No idea why but I absolutely love how these turned out. Can we just talk about how perfectly this image stamped? For my base I used China Glaze Merry Whatever and stamped using Powder Perfect's Black Stamping Polish. This next mani didn't quite turn out how I was hoping. It definitely looked much better in my head. If you take away the colour - this image is super cool in black and white. I seriously love it and am planning on doing it as a full mani soon. Polishes used for this mani are Emily de Molly Bright Retreat, Color Club Hello Sunshine, Darling Clementine, Flushed and Tube Top, and stamped using Powder Perfect Black Stamping Polish. I love this plate! I think there are so many really cool designs on it and I am really excited to keep playing with it some more. 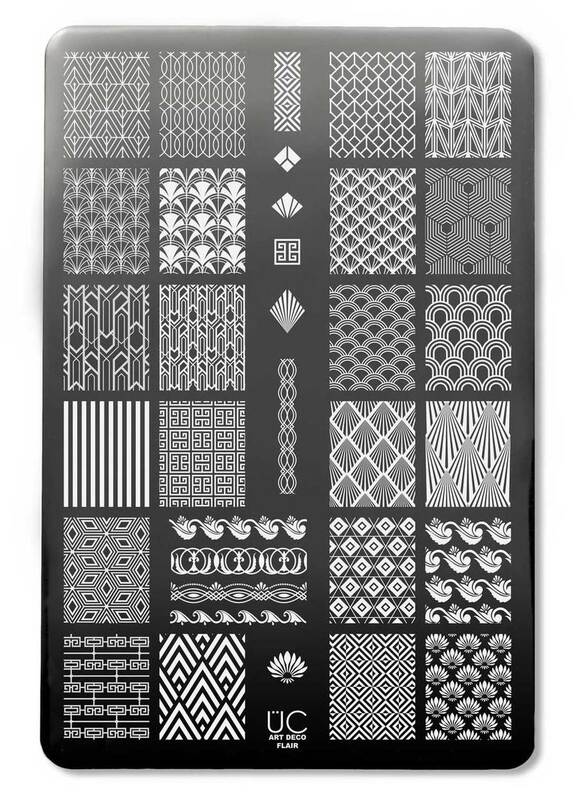 The Art Deco Flair Stamping Plate is available now from Uberchic Beauty.